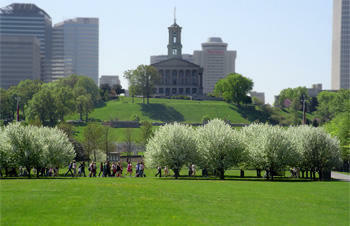 NASHVILLE, Tenn. (OSBORNE) -- T he Tennessee General Assembly is finally getting down to business after a slow-roll start to its 2019 session. More than 30 committee and subcommittee meetings are scheduled for this week in the House and Senate. As is typical for the Tennessee Legislature, firearm and Second Amendment related proposals are high on the agenda. John Harris with the pro-gun Tennessee Firearms Association says he counts some 60 gun related bills this session. He’s especially concerned about a so-called Red Flag measure that would allow authorities to seize weapons from individuals considered a threat to the community. Linda McFadyen-Ketchum speaks for the Tennessee chapter of Moms Demand Action for Gun Sense in America. Her organization supports the Red Flag bill. But Moms Demand Action will fight a measure that would eliminate jail time and reduce fines for carrying a concealed handgun without a permit. McFadyen-Ketchum believes it would encourage gun owners to skirt the law. Use this link to review all of the gun related measures being considered by the Tennessee General Assembly this session. NASHVILLE, Tenn. (OSBORNE) -- New Tennessee Gov. Bill Lee is getting some strong pushback after asking state departments to plan for two-percent budget cuts in the coming fiscal year. In preparation for budget hearings at the capitol, Lee asked commissioners to submit plans for budget reductions, but told reporters he hadn’t yet decided whether to make those cuts. On Friday, Corrections Commissioner Tony Parker told Lee to expect his department to ask for more funding to cover much-needed raises.